Which mail order store is a specialist in providing discount HP M4345x MFP toners? It is our goal to offer only leading quality toner cartridges so you don't need to stress about them harming your laser printer. Pick Cartridge Save for the extensive catalogue of bargain laser toners for your M4345x MFP printer! With Cartridge Save you'll receive totally free delivery as standard with each and every sale, whatever you have ordered. Our numbers reveal that out of the thousands of cartridges we dispatch each and every week, around about 98% will arrive next day. In order to give you far more security, every HP M4345x MFP toner that is purchased here will also feature a comprehensive money-back policy. The HP LaserJet M4345x mfp is a multifunction laser printer that can also copy, scan, and fax. This unit is favoured by offices for its reliability and small size. The HP LaserJet M4345x mono laser printer has a monthly duty cycle of 200,000 pages and delivers great quality output with a maximum print resolution of 1200 x 1200 dpi. Keep in mind that the HP LaserJet M4345x mfp printer bundle does not include essential cables. This robust unit boasts durable paper trays that can handle 1,100 sheets at a time. The control panel on the front has organised function buttons and a large LCD display. For connectivity, there are USB and Ethernet ports on the back. The LaserJet M4345x printer has a print speed of 45 ppm and it can continuously copy up to 1000 sheets. The HP M4345x mfp laser printer allows fax forwarding, junk fax barrier, polling, and remote retrieval. Users can save up to 100 numbers for speed dials. 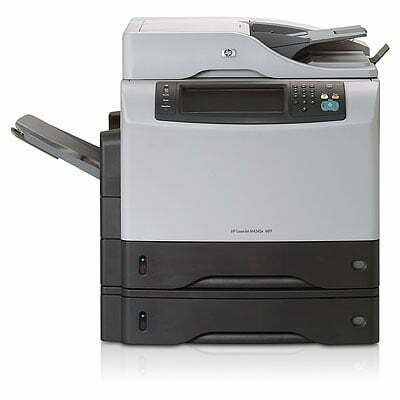 The reliable HP LaserJet M4345x all-in-one laser printer is easy to install, use, and maintain. It is small yet it is capable of 4 functions. Users can save time and resources as it has an automatic duplexer and an automatic document feeder. The HP LaserJet M4345x mfp multifunction printer is compatible with Macintosh and Windows computers and comes with built-in Ethernet. Cost-effective HP LaserJet M4345x black cartridges can print approximately 18,000 pages for low toner costs. The HP M-4345x printer model does not have Wi-Fi. The HP LaserJet M4345x multifunction printer also doesn't come with Ethernet and USB cables.